TechConfigurations has uploaded a video on YouTube showing off impressive renders of the Sony Xperia XZ4 based on numerous alleged leaks and rumors. The smartphone’s display is expected to offer a game-changing 21:9 aspect ratio, so not only will the device be tall and slender, it will also be able to play widescreen movies without any black bars at the top or bottom (letterboxing). 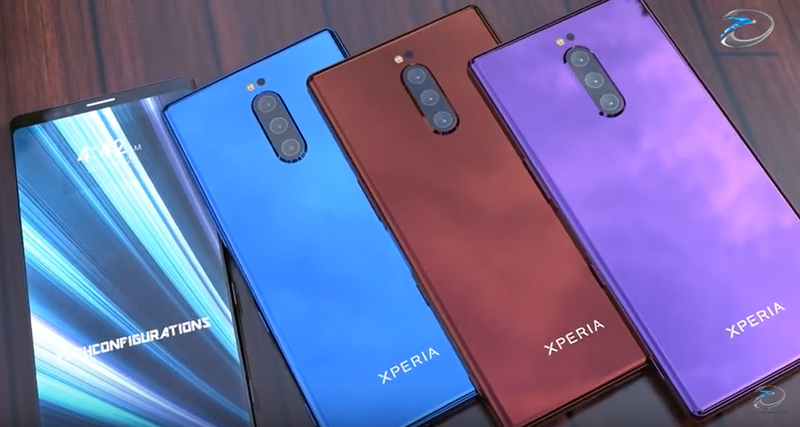 A video showing rendered images of the rumored Sony Xperia XZ4 in glorious detail has been uploaded to YouTube by TechConfigurations. According to the video description, the clip has been constructed by compiling leaks based on the smartphone’s possible specifications. If the video ends up being faithful to the final product, then it’s conceivable that Sony could honestly challenge Samsung, Apple, and Huawei for a larger slice of the premium-smartphone market pie. The video helps round up the rumors that have already started flying about the potential Sony flagship. A 13 MP selfie camera is the first thing to be highlighted, swiftly followed by a longing gaze at the expected vertically arranged rear-facing triple camera setup. Of course, Sony is noted for its expertise with cameras (only Canon and Nikon sell more cameras), so users can rightfully expect some serious hardware and software here. The clip then moves on to the striking display, which is described as a 6.5-inch QHD P-OLED with a 21:9 aspect ratio that can show movies in all their glory. It has been mentioned that the tall and thin device could come with a fingerprint scanner that is integrated into the side panel, as shown in the video. With a Snapdragon 855 processor, 6 or 8 GB of RAM, and 128/256/512 GB storage, this powerful premium smartphone would also appeal to gamers. An image of a supposed protective film for the Sony Xperia XZ4 has been leaked onto Twitter by Ice universe, which seems to confirm the expected aspect ratio and front design – slim bezels, no notch, and very tall. There have been some comments on the resemblance of the rumored flagship with Samsung’s Note 9, which in itself is not a bad thing. Sony has yet to officially confirm the existence of the Xperia XZ4, but the company is expected to announce something at 2019’s Mobile World Congress. If the Japanese manufacturer reveals anything similar to the rendered device in the YouTube video, then it’s likely it will rapidly gain an army of admirers. Then all Sony has to do is produce a compact version…and possibly a foldable variant, too.